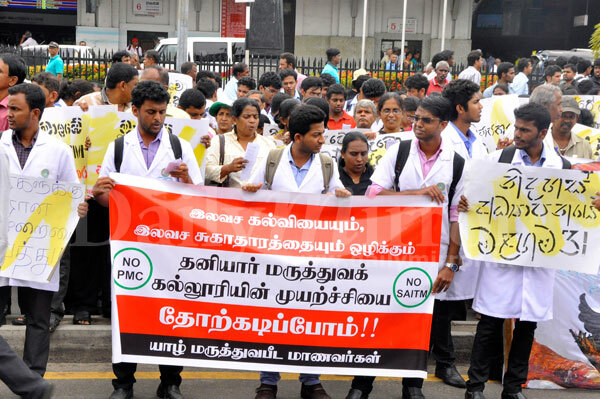 The South Asian Institute of Technology and Medicine (SAITAM) has recently become a key focal point of protest in Sri Lanka. Students and workers who have been peacefully demonstrating their opposition to government policies are facing ruthless suppression. In a brutal police attack on a protest demonstration that took place on 21st June, 85 students were hospitalised and several arrested. The government is going after the leaders of their union – the Inter-University Student Federation (IUSF) – trying to silence them by putting them in prison. The GMOA (Government Medical Officers’ Association) which represents health-workers has today (4 July) called for a countrywide strike starting from July 5th. The GMOA and the IUSF are demanding the overturning of the court decision to allow SAITAM to continue with its private college. They are also are demanding the nationalisation of SAITAM. The medical professionals and students have been protesting against a private medical college run by SAITAM for some time. But, despite mass opposition, the court has granted permission to the Institute to continue running a private medical college. There have been many complaints made already about how this private institution is actually run. But the main issue is that it is regarded as the first step towards the government’s wider agenda to start the privatisation process in the education sector. Free education is a proud achievement of the working class in Sri Lanka who won this right after long and hard battles in the past. Every government formed by the capitalist UNP (United National Party) has tried somehow to attack the public sector, particularly the free education and free health services in Sri Lanka. Each time they have been faced with enormous opposition. The previous Rajapaksa government, however, accumulated enormous executive power, based on the triumphalism it developed after ending the brutal war against the Tamils in 2009. It managed to push through some of the policies that had been difficult in the past to carry out. It also gave permission to SAITAM to set up the private medical college. The current coalition government, led by the UNP, continues to justify the setting up of this private institution and has indicated that they want to go further. They want to open up the education sector for private investment. They claim students will get more benefit and better higher education through private sector involvement. This is a bogus claim and simply a justification for not investing in the public sector. At the time of the election in 2015, the government agreed to spend 6% of GDP on education. But in reality they have only allocated 2%. An earlier finance minister cut the education fund, claiming the reduction was due to unused money allocated to education in the last budget. This is again bogus propaganda. The government simply refuses to invest to improve conditions in the education sector. University education in particular has very limited resources in Sri Lanka. In addition there is a lack of universities to meet the increased education needs. For over 300,000 who sit the advance level exam, only 25,000 have the opportunity to enter university. Among them, only around 3,000 students are admitted to medical faculties. Only around 13% of all students get access to higher education. Given the economic crisis, unemployment is increasing. The number of jobless is also increasing among those who had a chance to get university education. Privatisation in education will make the situation worse. Continued cuts in public education will worsen the bad conditions that already exist and only a small number from the rich elite will be able to access private education. Already the fees payable to private higher education stand at 1.3 million rupees (£6,600). Poor students or students from a working class background will never be able to access this education. Despite the high fees, there have been complaints that the established private medical college does not meet the correct criteria to admit students and that those who finish their education here don’t hold a high enough standard. The only qualification expected of students, it seems, is how much money they have. Despite mass protests, the government adamantly insists on continuing with the privatisation initiative. It is clear that the UNP-led government wants to break the protest movement to make sure that the door is clearly open for the private plundering of the education sector. It was one of the key aspects of their plan when they agreed to an IMF-dictated budget. The recent attacks from the government on behalf of the IMF and its policies has flown in the face of their so-called ‘yahapalanaya’ – ‘good governance’. They have shown how far they are willing to go to suppress the workers and students in order to achieve their class interests. SAITAM has become a central part of the battle against the privatisation initiative led by the capitalist UNP. However it is worth remembering that it was started in 2008, under the previous dictatorial and corrupted regime. Those around Rajapaksa and other communal forces now pretending to oppose SAITAM are doing so only for their own political gain. They have remained silent for the last seven years while SAITAM has been allowed to run freely. Neither the Rajapaksa clan, nor anyone around them, represents the workers’ or students’ interests. It is important that the students and workers coming forward to struggle against the privatisation realise this. The students, the GMOA trade unions and the working class who oppose SAITAM have to prepare to widen the battle among other sections of workers and poor people. Mass mobilisation and appeals to other trade unions for solidarity action are vital to strengthen the current struggle that is taking place. We must not surrender to the profit-mongers our hard won right to free education.